“Last time on…” Remember that? It was a miniseries staple (and a nighttime soap staple as well). No doubt these were the first word of thousands born between the mid-70s and mid-90s. We left off with Robert Shapiro (John Travolta) failing to produce O.J. Simpson (Cuba Gooding, Jr.) for arrest. 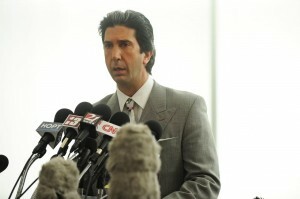 St. Robert Kardashian (David Schwimmer) is genuinely shocked to find O.J. has gone out the window, escaping with Al Cowlings (Malcolm-Jamal Warner). Marcia Clark is dumbfounded, saying the law and order segments of LA’s judicial system now look like morons. 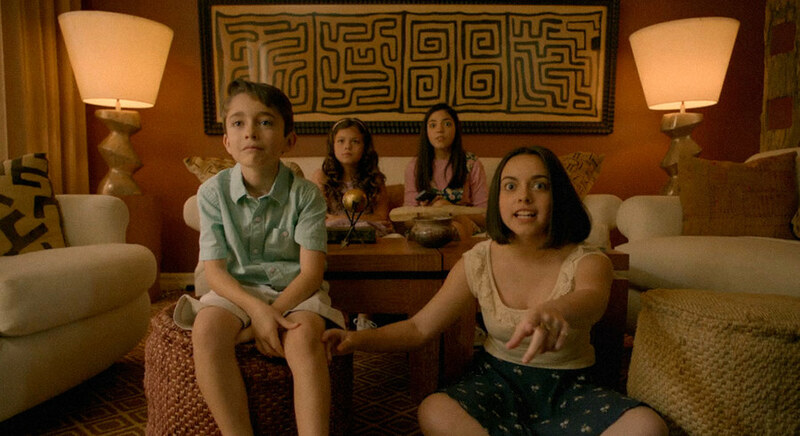 Quick Quiz: except for those of you who were not yet born, under 10, in comas or just REALLY tuned out, you do remember where you were during the Bronco chase, right? I was at a friend’s, we were having a quiet dinner and movie night. Dinner we ate, the movie never started. We watched the chase. For some reason, we picked ABC and if I lose my memory completed, I will never forget the stalling of the anchors, desperate for information, with Barbara Walters giving us the list of celeb and/or non-celeb-but-notorious killers with whom O.J. could be confined. How helpful of FX to give us a handy map! We’ll get to the chase in a minute. We have to start somewhere far more important: in St. Robert’s bathroom. It’s a damn nice bathroom, sunken tub with marble, gold handle, a color scheme that is muted and inviting. And in it, St. Robert is praying, Good Book and all. By virtue of his sainthood, he shouldn’t have to pray, the Big Guy should automatically know when one of his faves needs him. He quoteth from the Cain chapter, he endeth each verb with they way they were once pronouncedeth and his voice cracketh with emotion. “O.J. 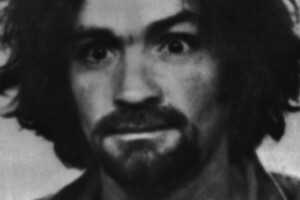 left a suicide note,” St. Robert tell Bob, shakily handing it over, actually believing what he’s thinking. “Who the hell signs a suicide note with a happy face?” Shapiro asks. People with names like Debbi or Tooti or Lil, people who put hearts over the i in their names, but I think it was a rhetorical question. The episode now begins to mix in actual newscasts and footage from the great race. It’s good to hear Tom Brokaw’s confidence (remember when anchors could have speech impairments like Tom and Barbara? ), to see Bob Costas’ warm assuring nature. The reactions to what is happening on TV is handled by extras who do a lot of murmuring and hand-to-mouth “I’m so aghast” gestures. The country comes to a standstill. Except at the DA’s office. “If it were our absolute goal, could we look more incompetent? Worst day of my life. Worse than the day I was diagnosed with cancer,” Garcetti rages. Yikes! He and Marcia are both horrified, but Marcia is more realistic. “He can’t hide forever. Everyone knows his face,” she clucks, though only days before, she couldn’t remember who the hell he was. Detectives Van Atter (Michael McGrady) and Lange (Chris Bauer) are flooded with tips from “crackpots” citing O.J. (including one saying he’s casually lunching with Dionne Warwick at The Ivy–once again, I’m sure Dionne is thrilled she got a mention). The media trucks race around LA, people flock to Nicole’s grave to set up a memorial and a white Ford Bronco stops to watch the latter for just a short moment before tearing out of the cemetery. 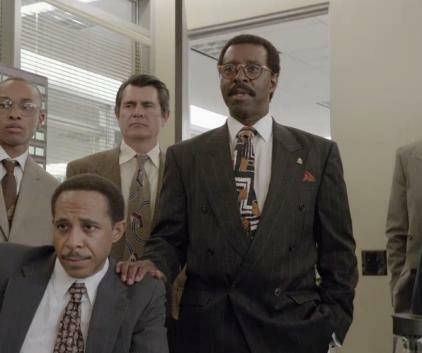 On the way to a press conference, Marcia asks who Al Cowlings is, with Bill Hodgman (Christian Clemenson) noting he’s a “fourth rate football player” and O.J. 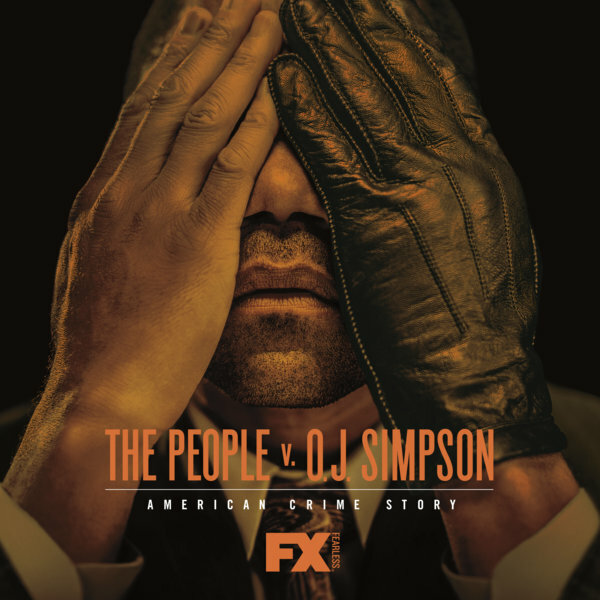 worshipper, “O.J…A.C., get it?” It’s Gil who has to warn the media and everyone watching not to help O.J. or they face prosecution as well. 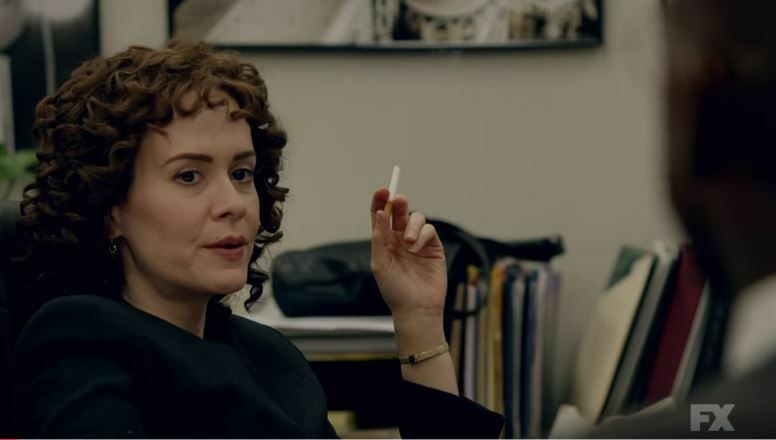 At Johnny Cochran’s office, one of his underlings says she knows O.J. did it, but another claims it’s only about hounding a black man. “Something big’s happening here,” Cochran coos. The episode’s first classic line follows. Batten down the hatches, friends, this one’s pure miniseries perfection. That would be Bob Shapiro, who can’t fathom anything not being about him, so he schedules an impromptu press conference of his own. He starts nearly every sentence with “I” and recount the times (again) he helped bring famous fugitive to jail. St. Robert watches from a few feet away in horror, but it’s Johnny Cochran who can blast Shapiro’s selfishness from the safety of hi office. “I wouldn’t be falling back on the pronoun, ‘me,’ ‘myself’ and ‘I’,” he tells his team referring to Shapiro’s tactics. Bob goes whole hog, begging O.J. to turn himself in “to any law enforcement official.” A reporter asks what O.J.’s last words to him were and he replies, “he was very complimentary, he thanked me for all I had done for him.” The reporters are too stunned to ask any further questions, so Bob has St. Robert read O.J.’s suicide note. “Oh my God, there’s Daddy! 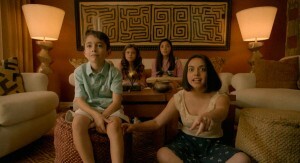 It’s Daddy!” four little Kardashians shout to the TV. St. Robert is still legitimately choked up, and it’s with a pained look that he reads the infamous “sometimes I feel like a battered husband” line, which Marcia hears in disbelief. “You know he cut his hand while killing her,” Hodgman says with withering sarcasm. “Who are you?” a bullish report asks. “Robert Kardashian.” “Kazaney?” he asks again. The guy is 10 feet away, how does Kardashian sound like Kazaney? Yeah, yeah, we get it, we’re supposed to laugh at the fact that no one knew a last name that less than 20 years later would be the most famous in the country. As for Kazaney, that’s more puzzling. Maybe her best friends endearing call Lainie “Kazaney” and the reporter had just been covering a big news story about Lainie Kazan? That doesn’t seem likely, but this is LA. St. Robert’s kids shout the spelling to the TV and start chanting it. We get it, people, we get it! 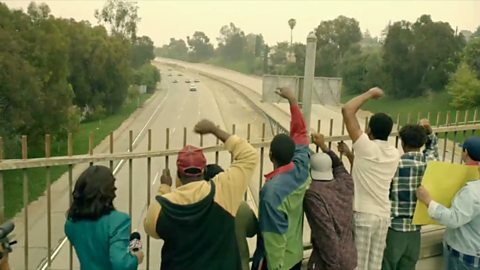 Over near the 405, the country’s worst road (they are on the 5 about to hit the 405 if you want to be precise and refer to the map), some kids in a VW van realize the Bronco on their tail is O.J.’s, so they cheer him on and then stop to call the police. Pre-cell phone, remember? The po po stop the van and demand A.C. and O.J. get out, but Al screams that O.J. has a gun. 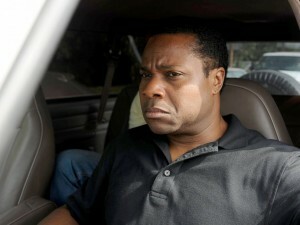 “I ain’t speaking to nobody!” O.J. brays from the backseat, gun to his temple, grammar lost in the madness. A.C. guns the gas and leaves the cops standing there. 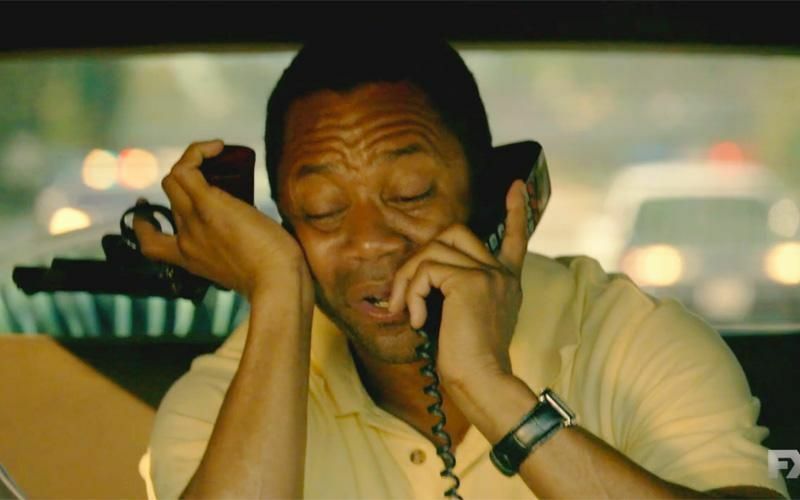 “I’m not shooting at O.J. Simpson unless somebody authorizes it,” one says to the other. How telling a line THAT will be, yet another of the miniseries’ attempts to keep viewer feeling smarter than the characters because we know what comes next. But, at that time, the public was squarely behind the Juice. 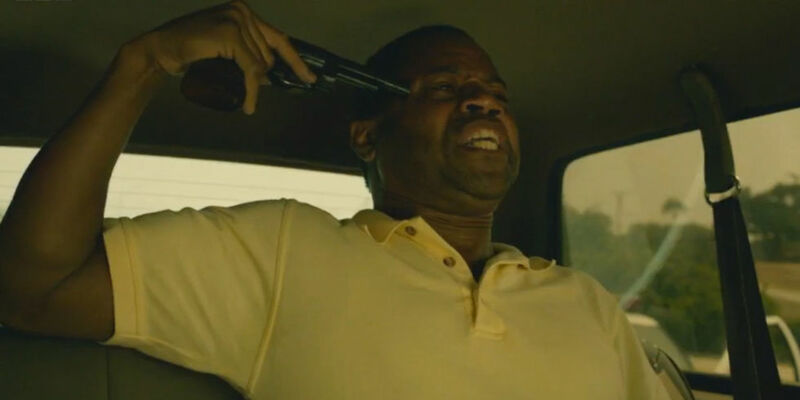 St. Robert heads over to Rockingham, so undone by events that he sits in his car, beats the steering wheel and screams at the top of his lungs. We don’t hear it, we only see it. That’s an awfully melodramatic bit of business, but I’ll allow it since it’s done like that to show just how noisy the supporters, cops and helicopters are. But don’t try that crap again, this was a one-time pass. DUDE, WTF? Why on earth does he say such an idiotic thing? First, they are all watching the news, it seems pretty damn clear he’s not dead. Second, who tells a family someone might be dead without actual proof? “He’s in a better place,” St. Robert keep saying over and over, holding his Bible. 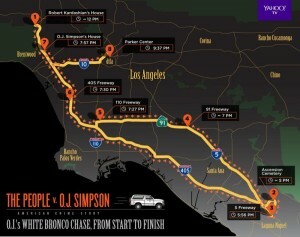 “No, wait, look!” O.J.’s daughter says AT THE VERY MOMENT the Ford Bronco pops up on TV. As for Mr. Shapiro, he’s blissfully unaware. He drives home listening to music, only for Mrs. Shapiro (Cheryl Ladd) to ask if he has seen the latest. “I did a press conference, I filled the gas tank,” he says (what? ), then darts over to the TV. “He’s still alive?” he asks incredulously. 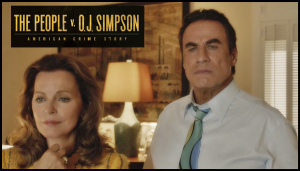 “Good for you, O.J., good for you. 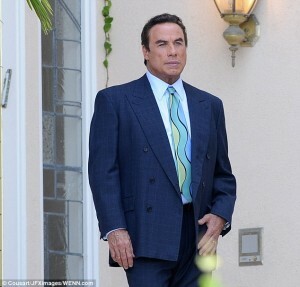 You’re still in the game,” he whispers, though it’s obvious he’s talking about himself, not O.J. It’s not obvious? Catch up, come on! As for O.J., no one in this episode cares yet. However, to be fair, he always was the least fascinating of the numbskulls involved. It’s getting worse at the DA’s office. Marcia wants the police to shoot the tires, but Gil advises not to do that while televised. Bill asks what the protocol is. “I don’t know, Bill, what is the protocol for an armed celebrity fugitive being chased by 12 police cars and seven helicopter,” Garcetti snaps back. Even Marcia raises an eyebrow at that much me-ness. Shapiro? The obvious answer, but no. Clark? Technically yes, but no, not her either. Kris Jenner? Of course, but not here. “O.J.’s news, entertainment and sports,” a local TV anchor tells the guy who sits in the soundproof room telling cameras where to go, despite the fact that the NCAA finals are on! “Put O.J. in a box!” the anchor demands. Nobody puts O.J. in a box…not for long. After someone scores a basket, NBC switches to the chase. The crowd at a bar is up in arms, but goes silent watching the chase, no box, full screen for the Juice. Marcia is nonchalantly walking around the office while the office is huddled around TV. “The back up on Sepulveda must be unbelievable,” a minion says. That’s helpful, thank you! I guess I won’t be taking Sepulveda. Glad I have that map to help me. Is anyone not thinking about himself or herself? “This is like the world’s longest Ford Bronco commercial,” yet another minion says. Okay, now that’s good writing. Cheesy, but worth a big guffaw. However, it’s doubly good writing because it leads to a great question that took until now for anyone to ask, and of course it’s Marcia who asks it. She call Van Atter to ask how they can be in the Bronco since it’s in the police lab for tests. It belongs to A.C., apparently. “He worships O.J. 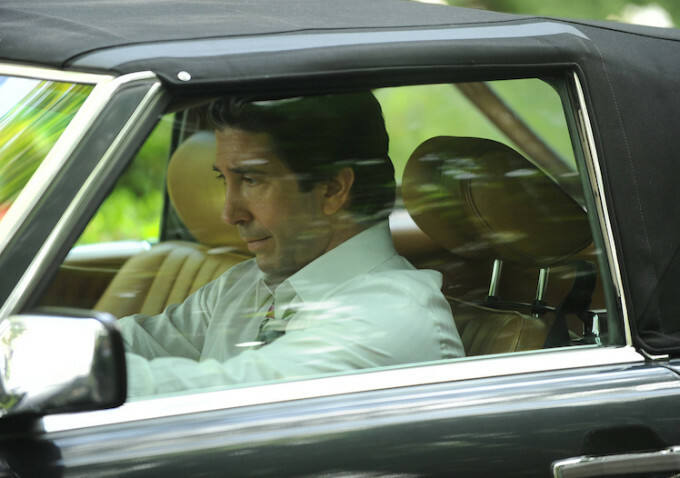 so much, he bought the same car,” Detective Lange notes dryly. Great question, Marcia. Pathetic answer, poor fourth-rate A.C.
FYI, and this is a fact, not something dreamed up by the program: pizza delivery zoomed so high during the chase that they ran out of supplies. The poor teenage schmuck who manage the pizza joints are going to get chewed out big time. “I just called to say, I love you! I just called to say how much I care. I just called to say I love you and I mean it from the bottom of my heart,” O.J. does NOT sing to St. Robert, but it’s pretty close. Someone put up the tinted glass divider, I’m not sure A.C. needs to hear this much back-and-forth love not directed at him. O.J. then give St. Robert a list of people to call to tell them how much O.J. loves them (Kris is not included, though she is mentioned). He’s on his giant mobile phone, why can’t he call? Oh, right, he’s still holding a gun to his head, being all dramatic and suicide-y. “Hey, Uncle Bobby, is my dad gonna die?” Jason Simpson asks. I won’t sugar coat it. It’s possible. St. Robert is the worst hostage negotiator/comforter, so if the Juice keeps calling him, it could definitely end badly. Also not a good choice for talking O.J. down is Johnny Cochran, though they don’t know each other yet. He’s fascinated enough by the obituaries being readied to go on TV and remind viewers of two thing: “Innocent until proven guilty,” which even the interviewer talking to him doesn’t buy and he LAPD is racist, a hammer-throwing defense tactic before he’s part of the team! He even cites specific cases, very dramatically. His client’s “only crime, the color of his skin.” How i the interviewer supposed to bounce back after that? That’s what made Johnny a genius. Speaking of hammers, though not of the sledge kind, I think we the viewer understand this episode’s them: me. 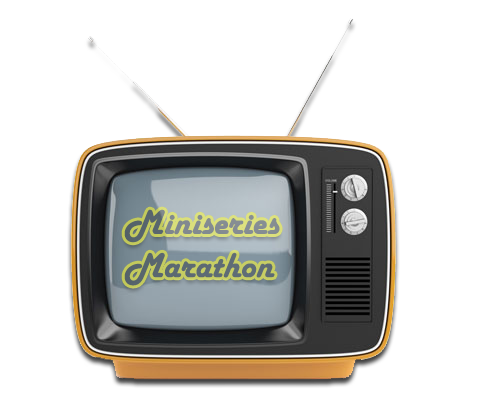 Not me, the Miniseries Marathon, me as in each character. 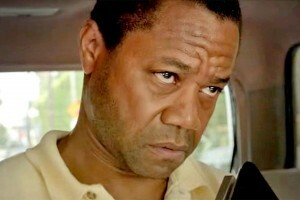 So far, only Darden has not made this chase about him. He’s no more a part of the prosecution team than Johnny is of the defense, but he has so far only expressed concern for tightly-wound Marcia, not himself. Well, St. Robert is selfless, but he’s a saint, so that’s part of the gig. I know, it’s a tough call. Theo Huxtable is responsible for perhaps the episode’s funniest exchange, though probably one missed by most. The car phone rings. “WHAT? Who is this?” A.C. roars. “Wh, dja, um, you tell the cops to back off, stay away from us” sputters A.C.
“So, uh, I understand you have a gun,” Lange notes, unprepared to answer O.J.’s super sweet apology. He and Lange go back and forth. Lange has done the best job so far at saving a life, but O.J. is in self-pitty mode, despite his worry about police overtime (if that were really true, he would have thrown the gun out of the window like Lange asked him to do). Lange can work with this, however. He tells O.J. they will let him go home. “O.J. never gave back,” he says, going on to list all of the things O.J. never did, like dedicating a park, and then he damns him completely by adding, “once O.J. made his money, he split and never came back.” “He got the cops chasing him, he’s black now,” the neighbors cackle, overriding Darden’s anti-O.J. stance. Marcia: “I want him to finish this day alive. I want to pay for what he’s done.” Thank you, Medea. 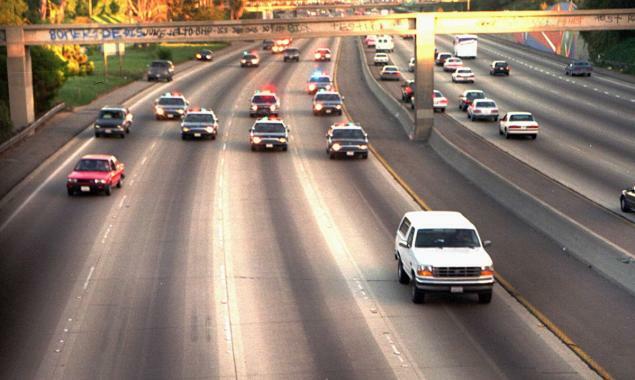 Many Angelinos cannot be convinced O.J. is guilty, especially not with cameras around. Thus, they pull out their poster board, paints, bedazzles and drawings to hang supportive signs off every overpass, cheering loudly as O.J. underpasses. 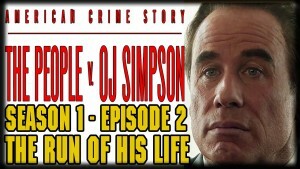 A.C. convinces O.J. that the people still love him (he fears for their safety standing on overpasses), but he’s noticeably tickled to see the show of support and love. He is a celebrity, after all. Brentwood is a zoo, with the media, the fans and the cops making it nearly impossible for A.C. to get him home. The neighbors must be soooooo pissed. 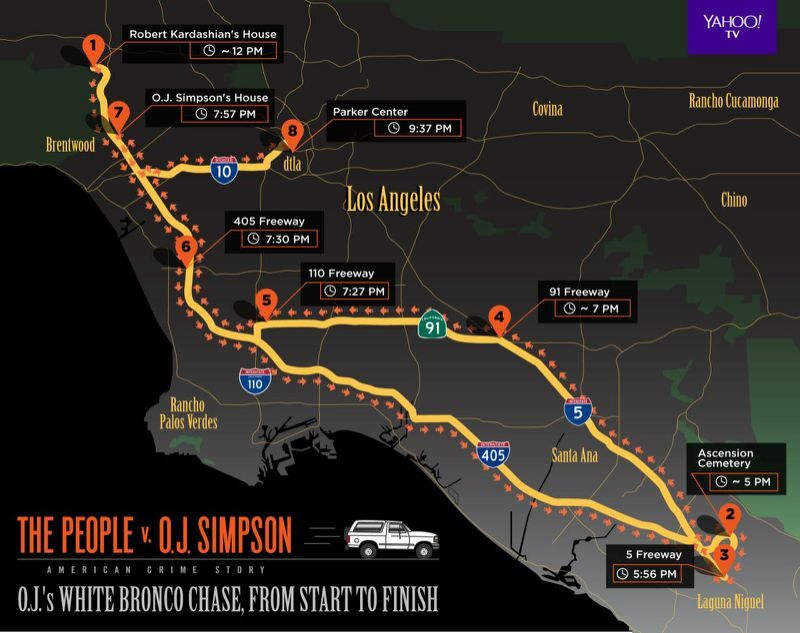 SchizoJuice sits in the Bronco with A.C., but A.C. sees the lights and the snipers and he refuses to get out or to let O.J. out. “Okay, kill the lights,” a policeman says. But Cochran knows nothing about why the lights went off and guesses aloud, “they don’t want us to see.” Johnny, we know. We know. What happened to the Shapiros? Just wondering. Actual police negotiators try their best, but A.C. plays rabid dog to keep everyone from the car until O.J. decides what to do. Finally, someone puts St. Robert on the phone and with SchizoJuice (still apologizing to the police for their extra Friday night work). Though O.J. is a blubbering mess, he’s absolutely in control. He manipulates St. Robert into having the police agree to not arresting him outside in front of the cameras. That is not the wish of a demented man, but rather an overly-clever one. A.C. gets out, O.J. puts down the gun, takes the photographs he’s holding and starts to exit the car. “Sorry, I’m sorry, sorry, sorry, you guys,” he repeats. The police are about to blow him to bits seeing the photographs in his hand, but like a hero dashing in front of a bus to save an old lady from getting run over, St. Robert manages to stop the ENTIRE police force by shouting, “those are just pictures of his kids!” This would have been fun to see in slow motion. Just saying. It also begs the question of how an army of police could mistake a square picture frame for a gun. I don’t know much about guns, but I don’t recall seeing any square ones. All 2’8″ of O.J. (as played by Cuba Gooding) stumbles inside and into St. Robert’s arms. “Can I speak to my mama? And can I get some orange juice?” O.J. wearily begs. “We’re taking him to trial,” Marcia hisses when Dan Rather finally signs off, the day’s events over. “I can guarantee you O.J. was not framed,” Christopher insists. “Sure he was,” Papa Darden says, slinking over to his son and whispering, “you stay the hell away from this.” Wow, slick, now the writers are giving foreshadowing to under fives. O.J. is arrested to twinkling-yet-important piano underscoring and one-by-one, the police car disappear from Rockingham. Thus ends the Caper of the Killer in the Car, or Ford: Built Tough.